Industry leading knowledge management software updated. New online demo launched! Knowledge management software solution and FAQ software for articles creation and management. Knowledge Base Manager Pro is commonly used as PHP Knowledge Base software, Enterprise Wiki Software, and for Business Knowledge Management. 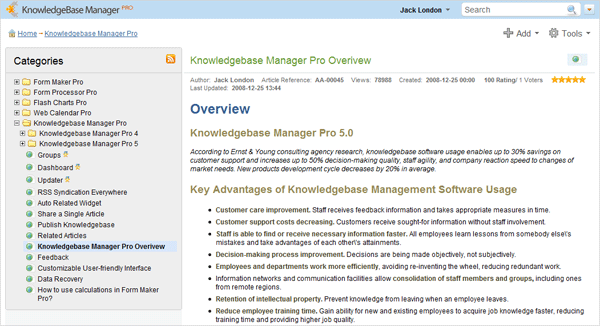 Online demo of Knowledge Base Manager Pro v5.1 has been launched on May 7th, 2009, after a grueling four month long development cycle, long gap between updates even for such a powerful product. We analyzed major features of competing products and had a hard work making them more flexible, more usable, and more solid. We did our best to bring as many features our customers lacked in previous version as possible. That wasn’t a simple task because we received hundreds of suggestions of new features from our current and prospective customers and it was necessary to decide what we take and what we leave… for now. 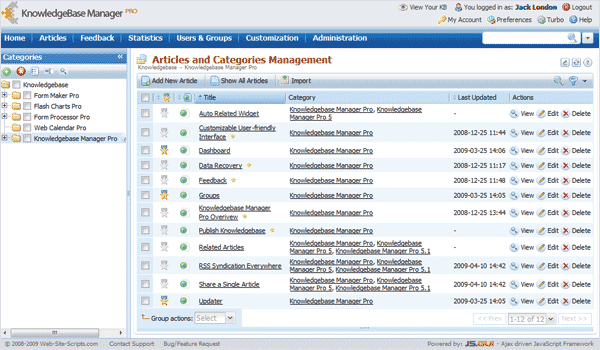 We had a plan with plenty of features appointed to the next release right after launch of Knowledge Base Manager Pro 5.0 on December 25th, 2008. However, customer requests showed us that we correctly predicted most features (Custom Fields, Extended WYSIWYG) necessity, although other features (Workflow, LDAP) are not so popular and could be delayed for further releases. At the same time we learned about highly requested features that were not included in our plan for the 5.1 version previously (Separate Glossary, Login in the Frontend). When we started alpha-testing, we’ve found out that such a huge amount of features we added leads to unnecessary complexity and we decided to breathe new life into user interface of Knowledge Base Manager Pro. These reasons made version 5.1 development process four months long. During this time we weren’t able to show somewhat significant results. Anyways, we can do this today! 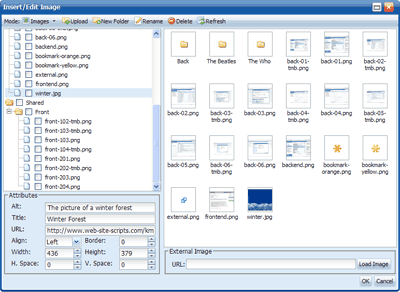 Media gallery allows storage of images, video, and flash within knowledge base and easy inserting of these objects directly to an article. You can upload an image or multiple images at a time from your PC. It is also possible to get image from other website by URL. You can set special attributes (e.g. : align, width, height, etc) for inserted object of each media type. Additionally to existing three publication profiles: Full knowledge base publishing, Single article publishing, and Auto related widget, we also added category publication. You can now divide your knowledge base into several categories with different level of user access, and open for public access unrestricted categories only. On the other hand, it is possible to have several knowledge bases on different subject fields within one Knowledge Base Manager Pro installation and publish them on your websites separately using this feature. Custom fields are user-defined variables that can be assigned to articles. Custom fields provide additional level of organization and filtration of articles in your corporate knowledge base. They allow greater customizability of types of data collected with the knowledge base entry. Custom fields’ vital property is that they are searchable. When you search for an article you may want to provide additional details about which articles are you interested in: articles that are applied to 2.3 version of software, or articles that contain solutions for Windows or OSX, for example. Custom field can be set to be required so that each article must have some value filled for this field. Some custom fields may be viewed by your staff only if you don’t want to show them to public users. Text field – basic single line text box custom field to allow simple text input. Text area – a multiline text area custom field to allow input of longer text strings. Multi select – multiple values in a select list. Multi checkboxes – multiple values using checkboxes. Radio buttons – a group of radio buttons. Select list – single selection list with a configurable set of options. Combobox field – single selection from values in combobox. Number field – a custom field that stores and validates numeric (floating point) input. Email field – a custom field with email validation. URL link field – allows links to other site to be added to an article. Date picker – a custom field that stores dates and uses a date picker to input them. Date time – a custom field that stores date and time values. With the new version we have created new front-end style with dynamic menus and category tree. It utilizes space more efficiently and provides convenient navigation. It is simple to look through several articles now, just click on the left category tree elements. KnowledgeBase Manager Pro has about 13 page layouts like Article Page, Main Page, Glossary Page, 404 Error Page, etc. Each layout consists from blocks (Comments Block, Advanced Search Block, Glossary Block, Menu Block, etc; there are about 30 blocks) and each block contains snippets (usually little blocks or text string; there are more than 100 snippets) along with its own code and structure. Each element can be customized according to your web site design and style. For further customization you can edit well commented CSS code. KnowledgeBase Manager Pro supports flexible permissions scheme from early versions. In the 5.1 version we have also added permissions for new features like custom fields and author statistics. 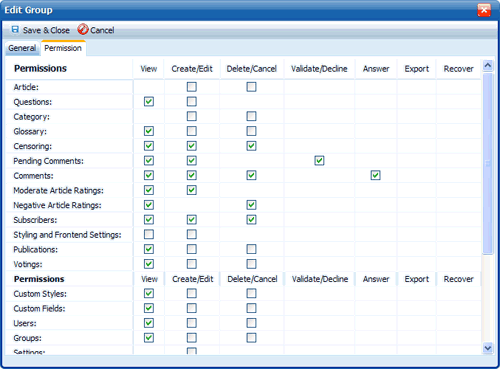 Permissions for all functions and modules are presented in a table view now for your convenience. 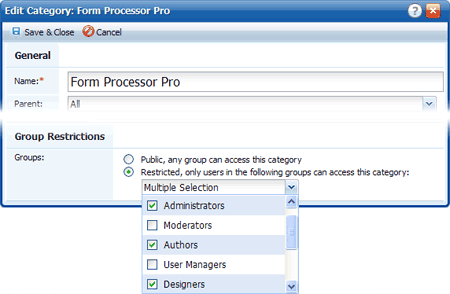 You can view the tree of categories to which user group has access when you edit its permissions. But if you have a lot of user groups and few categories, it might be convenient to setup permissions by editing category properties. When you save category properties after changing a list of groups that may write to this category, confirmation message appears and asks if you want to apply changes also to subcategories and articles. This helps to change permissions quickly even if your knowledge base contains thousands of articles, hundreds of users, and dozens of categories. New version allows logging in to the public area for knowledge base authors and administrators. They will be able to see the same content that they cay see from the admin area but in more comfortable way. It becomes extremely convenient because you can close part of content to unauthorized users. This feature has two following sub-features. Logged in users can comment articles or add them to their favorites list. Authors can create and edit articles or categories right from the public area from now on. It saves much time because most mistakes and typos are being found while reading. New autosaving feature is vital for interruptible Internet connections and unstable browsers. It prevents you from redundant work in case if you’ve already created a huge article with rich formatting and numerous images, and your browser window just collapses burying hours of your work because you’ve forgotten to save it. From now on you just do your work and if something bad happens, you just need to open autosaved article and continue. Autosave interval can be set – how often the article is autosaved. Ability to save article as draft for further editing – you may not save fresh changes to article if you didn’t finished, but just save draft instead and continue later. Article cross-editing notifications – if somebody edits an article, this article becomes locked and other users receive appropriate notification. Notification for article that already has a draft version – if you open an article that has a draft you’ll be prompted to continue editing. Drafts tab on dashboard – the dashboard has a list of drafts created by you, so that you can quickly access them. From now on each article and category URL includes its title becoming readable by users and helping search engines to index them in SEO friendly way. To attract user attention to some most valuable articles, you may set them as “featured”. These articles are shown at the top of articles list and are marked with a star. 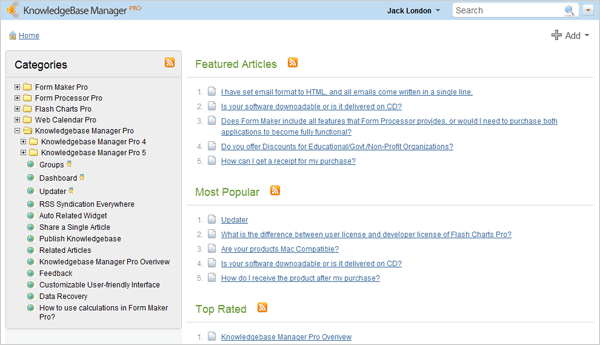 Featured articles are also shown in the backend and it is easy toggle the “featured” status of each article from there. 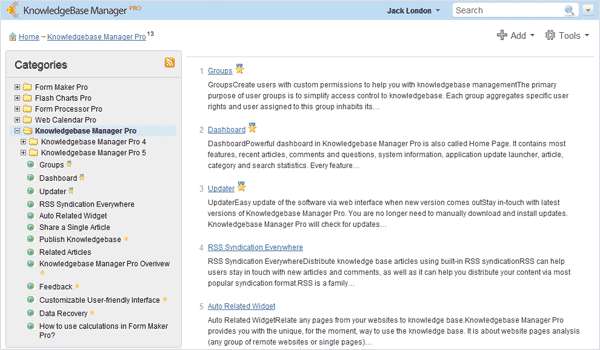 We made Knowledge Base Manager Pro intuitive and user-friendly, but any new feature tries to make it more complicated. That’s why we revised main menu navigation and added optional tips for each menu item and each section with enough information to find sought-for function. 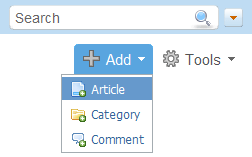 It is possible now to add an article, category, user, or user group from any place with just one click on main menu. Tooltips are enabled by default, but you may turn them off when became familiar enough with the application. 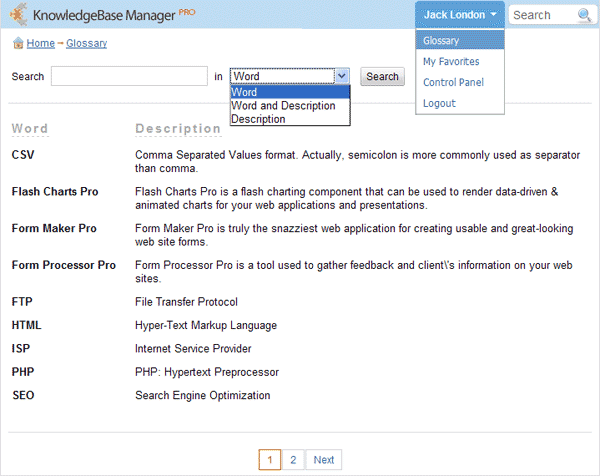 Glossary of terms has been added to Knowledge Base Manager Pro from the early versions. You added words and explanations to application and users saw such word decorated with dotted underline, and saw explanation by pointing mouse to this term or phrase. However our customers inquired us frequently about making of a glossary with these words and we have included this feature too. You can browse the glossary page-by-page or use search function to find some special term. You can search either by term name, or by words from description, or even by both parameters. This feature was also present in previous versions. When user sets negative rating to an article, he had to explain why he is doing that and how article can be improved. These feedbacks were sent by email to the author so that he has been able to make use of them. In the new 5.1 version of Knowledge Base Manager Pro we added a specific section where all negative articles are listed. Moreover, each negative feedback is attached to an article from now on, so any author seeing an article with negative feedback can improve it. We have added “Preview” action to the articles list, article view, and article edit windows for your convenience. When you click on this button, new browser window opens showing the article in the front-end, thus you can immediately see how it looks there. Now you can hide sidebars in back-end in one click when not required in order to get more workspace. It is extremely useful for small displays of netbooks and subnotebooks. This is an improvement of previous feature that allows changing of sidebar width by border drag-n-drop. There is a classic problem for a multiuser system as interceding update problem. That’s when several users want to update single data unit simultaneously. 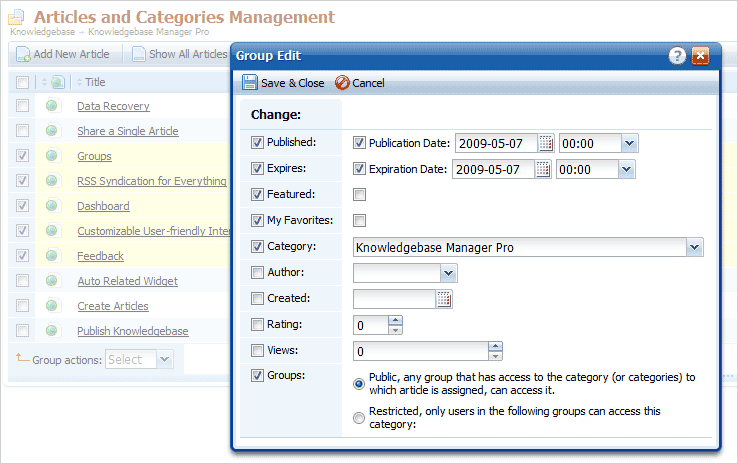 This problem was solved in Knowledge Base Manager Pro by article locking. When an article is being opened by one user, it becomes locked and nobody else can open it to edit for some predefined by special setting time. Article will be unlocked immediately if user closes editing window, or if some amount of time was passed from last saving (this setting is called “Article Unlock Timeout” and can be customized in application preferences). This article unlock timeout helps to avoid scenario of permanent article locking when user opens article for editing and then closes browser window. Publication Date – you can set when given group of articles will be published to become visible at the front-end. Expiration Date – opposite action, it makes articles invisible at the front-end from a specified date. Featured – this action pins articles to the top of respective categories showing that these are special in some way. These articles are shown with medal icon. Add to My Favorites – adds articles to current user favorites list. 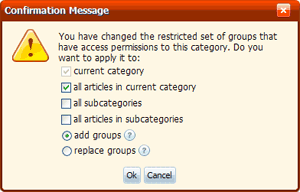 Groups – most valuable addition, it allows bulk change of article access permissions. Context navigation – navigate to respective section after new item creation. E.g. : after creation of an article – go to Articles & Categories section. If unchecked – stay in current section. Main menu tips – show detailed description for each main menu item if checked. Module tips – show related help information for each application module if checked. Set column minimal width – change the minimal column width to automatically fit the column header. Open articles in maximized window – open Edit Article and View Article windows maximized. If disabled, articles are shown in windows of standard size. Open compare articles in maximized window – open article versions comparison window maximized. If disabled, article comparison is shown in windows of standard size. These preferences may have default values set up by administrator globally. Administrator can also hide them from users. Some column titles received icons instead of titles in order to save some space. Column names can be also seen in tooltips. Local Knowledgebase received a lot of new options and preferences. Anonymous – unauthorized users can see published unrestricted content. Headers and structure only – unauthorized users can see category structure and article headers. When they click on an article header to see article contents, authorization form will be shown to them. Authorization Required – unauthorized users can’t see any content without logging in. Only authorization form is shown until logon. Ask a Question button show/hide option. Quick Jump menu show/hide option. Article URL format – SEO- and user-friendly URL may include category path and article title, or article title only. Custom extension for article URLs. Meta Keywords and Description for home page. Custom logo for public knowledge base header can be uploaded by user. Customizable number of articles in Recently Added, Most Popular, Featured, and Top Rated article boxes. Recently Added, Most Popular, Featured, and Top Rated article boxes can be shown or hidden independently. Article sorting options (ascending/descending by title, popularity, rating, update and creation date). Numerous customization options for new page layouts: My Favorites and Glossary. Search options and options for search page layout. Local Knowledgebase also received a separate module for all settings configuration. We want to say “Thank you very much for your help!” to everybody who contacted us via live chat, made phone calls, reported bugs and requested features via support ticket system, posted comments in our blog, and to everybody who appreciated our efforts and said kind words about Knowledge Base Manager Pro. We are proud of what we’ve done. This release is a good milestone, and we understand that we managed to implement all major and must-have functions. It is a good basis to continue and build more advanced features. 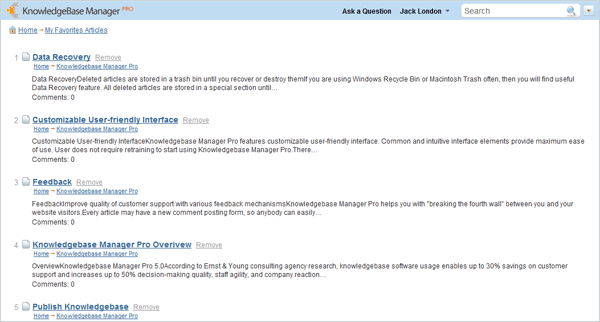 You’re welcome to play with the Knowledge Base Manager Pro online demo and leave comments with your impressions. We are currently preparing software packages for the new version and update packs for our current customers. Do you have an idea or a feature request? We want to hear from you! You can now go to Knowledge Base Manager Pro Ideas Lab and vote for some existing feature requests or add your own feature suggestion. This entry was posted on Friday, May 8th, 2009 at 6:35 pm	and is filed under Announces. You can follow any responses to this entry through the RSS 2.0 feed. You can skip to the end and leave a response. Pinging is currently not allowed.